On 9th November Adam Simonides was riding to work in the car with his father, when a huge deer darted into their car near the village Košická Belá. Adam, 26 years old at that time, was seriously injured in this accident. Although no signs of injury were immediately visible, he´s found himself not able to move ever since. He sufferred a fracture of fifth cervival vertebra and a spinal cord injury. At the L. Pasteur Hospital in Kosice specialists could only stabilize Adam´s spinal column. His arms and legs remained immobile and after a few days respiratory problems occured. Adam had to be connected to a respirator. 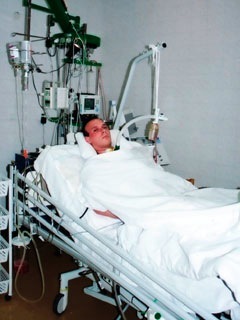 After all his great endeavour and hospital staff´s attention he learned to breathe with a diaphragm because all of his intercostal muscles stopped working. During the following 9 years Adam went through 15 surgeries including an oncological one. Despite all this, he hasn´t lost his optimism. The present modern technology enables him to operate his computer by head movements, thanks to which he can make phone calls, use the Internet, and spend his time creatively and meaningfully.